There’s a comfort as a reader when you get to know an author through her work. You know that, the more you read of that particular author’s writing, you can always depend on a quality product. And that is absolutely true of Molly Greene. I had the very good fortune of “meeting” Molly about the time the Girl with Book Lungs was beginning. She’s been extraordinarily gracious and patient with me and, instead of ME finding a way to reward HER, she always ends up being the one to reward me with an excellent story. Molly’s Gen Delacourt mysteries are set in one of my favorite places: San Francisco. I know that, by reading these stories, I’ll catch glimpses of the place I enjoy so much and remember my visits there. But that’s just a personal added bonus. Not technically a cozy mystery, Swindle Town is the fifth Gen Delacourt mystery to have a cozy “feel” to it. Gen is a private investigator. My, I mean, her boyfriend, Mack, is a member of the San Fran Police Department. The mystery in Swindle Town seemed rather easy; something Gen would zip through within a matter of chapters. But, as is the case with so much in life, there is more than what meets the eye. As she investigates some missing empty wine bottles, Gen is pulled into a bigger mystery that seems to expand chapter by chapter. Everyone seemed to be a suspect to me and I couldn’t imagine how it would all end. Each chapter perfectly sets up the next, which makes it very difficult to set this book aside! But one of the best things about these stories is the characters. The way each is written means that, as readers, you really get into their minds and hearts. They are more than words on a page; they are people whose adventures and romances and everyday lives you can clearly see in your mind’s eye as you read. 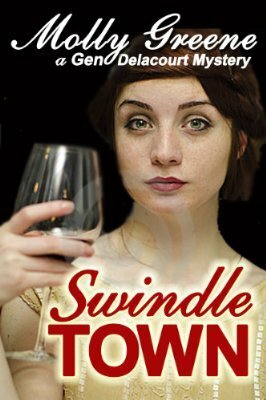 Swindle Town is another great installment and another great piece of fiction from Molly Greene.